GOOD MORNING WORLD! IT’S DAY THREE!! This morning the house woke up feeling relaxed and ready to get into the studio. Everyone took their time to get showered and dresses - I even had enough time to throw some laundry in the wash before we headed out the door. Laughing the whole way there; we arrived at the studio at 11:30am. After yesterday’s studio session; Lloyd sent the bedding track home with us so the band had a chance to listen over each track and be certain that the drums were perfect. To no surprise, the drums were perfect. Brennen had successfully recorded editless takes on all four songs. We were ready to move on to overdubbing Tates guitar! Since we no longer needed to record drums, Quinton gave Brennen a hand tearing down and packing his car while Lloyd worked with Tate to set up his guitar for recording. After the first run through with Tate; Lloyd tossed some suggestions his way to ensure the cleanest sound was coming through for the recording. I made myself a cup of tea and sat in the control room with Lloyd and the rest of the band to watch the magic unfold. A handful of takes of each song; some minor adjustments; and pausing to choose which pickup to use and it wasn’t very long before Tates guitar parts were finished being recorded. The entire process is really cool to watch - doing and redoing takes; hearing input from Lloyd; listening to each part as it’s being recorded; watching each band member experience being separated from the group and put on the spot; hearing it so many times that you can feel the knots of excitement bunch up in your stomach when the jackpot has been hit and the perfect take has been recorded. It was so nice to see how good everyone felt about the progress that was being made. The songs were coming together beautifully - and in my opinion, they were making great time. There was still four hours left of today’s session and all of tomorrow to complete the tracks for the EP and everything seems to be going at a great pace thus far. By 2pm I was starving, and so was everyone else - we had some more egg salad with us today! This time it was made by the beautiful man on keys; Tanner - who likes adding every ingredient available to the food he’s making - and it was delicious even with all the paprika he had added to it. Lunch was a good excuse to put my laptop down and just listen while I ate. Without my laptop in front of me I was able to pay better attention to the beauty that surrounded me. I was able to focus on the sound and the feeling in the room. I was able to relax, close my eyes for a moment and just enjoy the day. Brennen and Tate took off around 2:30 so they could get all their stuff done before the show tonight - Opening for Jesse Roper at The Pyramid Cabaret. Now it was after 3pm and it was time to get Tanner in the room to record the overdubbing for his keys. He was so excited to use the grand piano that he bolted into the room and started dancing his fingers up and down along the keys. He played around for a bit while we waited for Lloyd to return from a quick detour to the cafeteria. Since he had been working while the rest of us ate; it was now his turn to grab something for lunch. Tanner’s playing flowed beautifully as he ran through his parts. Personally - I was really excited for him; to be able to play on something larger than a keyboard. He had recently invested in a better keyboard; with a full 88, weighted keys, but nothing quite compares to the heavy, grounding feel of the keys on a grand piano. Our little Schroeder was finally able to use his talent on a real, classic grand piano. He took to it like butter on toast - scrumptiously. It was such a treat - and he made it look easy while recording his overdubs. Despite telling us he was nervous; it sounded wonderful. Lloyd and Tanner spent the remainder of our studio time working to perfect the piano takes and by quarter-to 6 we were ready to pack up and head home to prepare for tonight. Once again, progress was made, music was played and things were coming together beautifully. Everything was going according to schedule and we were all excited to get back in the studio tomorrow for the final day of recording the overdubs. It’s time for me to say goodnight - for now - so we can hit the road and get to the show. Thanks for staying tuned in to our blog so you can hear first hand about the House Handshake experience in-studio. Todays studio session was scheduled to start an hour earlier and we were definitely not going to be late for this one! It was such perfect timing, really - we pulled into the parking lot directly behind Lloyd’s vehicle. We were all smiles as we noticed each other and, with the calm I felt in the air, I could sense that the band was going to get off to a great start today - and it was going to be productive as hell. Sadly I had to miss the first bit of today’s session because of a 9:30 am appointment but it went by quickly and I was able to make it back to the studio by 10:30. When I walked in the studio, the doors were shut - to stop the studio sounds from engulfing the rest of the people in the building - recording was in session! I took a moment to sit and listen until I had an opportunity to join Lloyd in the control room. The sound dimmed and I could hear the shuffling of feet. Sarah walked out of the studio and smiled when she saw me sitting in the front room. She was followed by Tanner and Lloyd. It was time to refill waters and take a quick bathroom break. This was my chance to slip into the control room! It was nice to be back with my fam and to be back in the studio. Tate wasn’t able to join today’s session, and after recording a couple more takes; Lloyd had to head to his own appointment. Luckily we had Ryan - another studio chap - to briefly take over while Lloyd was out. There was a nice energy flowing through the studio today. 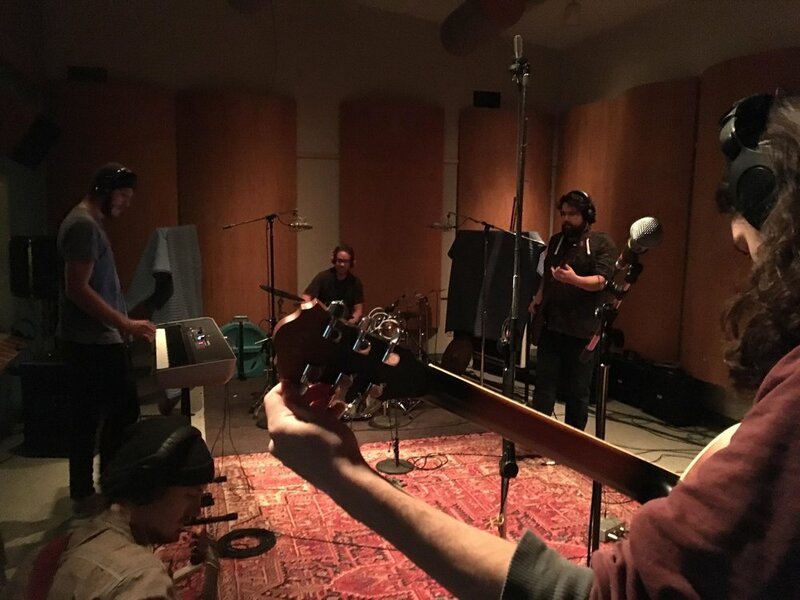 Everyone was in high spirits; there was no anxiety clouding the music and that calm feeling I felt when I dropped the band off had grown like jungle grass throughout the entire studio. Productivity was high, yet there were jokes and laughter everywhere. At one point; Quinton called out to Ryan to stop recording and said “Hold on, let’s do that again, my pick felt uncomfortable.” Which just made everyone laugh a good belly laugh before restarting the take. I snapped a few photos mid song - capturing Darrell’s groove and Sarah’s power. I have really loved watching the way everything has been coming together these last two days. The little suggestions from Lloyd and the collective agreements amongst the band continued to give each song that solid, powerful, oomph that we all hear at their live shows; while also keeping the sound clean and organized for the recording. At one point, while recording, Quinton brought our attention to the fact that there was a ladybug on his microphone. I was once told that ladybugs are a sign of good fortune when they turn up in places they don’t normally hangout - like inside a studio - and I’ve never believed it as much as I do now. Seeing the ladybug - although it is just a ladybug - was like a nice reminder of all the effort, all the dedication and all the passion that has contributed to the amazing opportunities and outcomes the band has experienced together. I am so thankful that I have had the chance to join them on their journey and watch this incredible experience unfold. It was finally time for lunch and we were all so excited to sit together and chow down on some sammy’s stuffed with the delicious egg salad Sarah had made for lunch. Once everyone had had their fill we stepped outside to get some of that good ol’ fresh air and stroll around before the band got back to the grind. There was still a bit of time before Lloyd returned - and the band had already finished “laying the bedding” for the tracks on the EP - which meant there was enough time for a little jam sesh! It was a nice step away from the usual practice space and it looked like they enjoyed Paint Box Studios Equipment. As I sat in the control room, I heard a voice talking to Darrell in the front room. It was Nathalie from our friend from Prairie Mix! She joined us in the back and I could see the excitement radiate off of her as she gave her hello-hugs. It was cool to see how happy everyone was to show her what they’d been working on. Ryan played each bedding track for her and I watched as she nodded her head to the beat and smiled more with each attention-grabbing sound. When we were done listening to all four songs Nathalie chuckled about how impressed she was with how much has actually been accomplished over these last two days. Any anticipation for criticism that previously existed flew away with those words. I think, sometimes, it’s easy to forget how far you’ve come when you know you still have so far that you want to go - and it’s always nice to be reassured that you’re doing better than you think. Lloyd returned and, shortly afterwards, Nathalie said her goodbyes to allow the band to get back to work. It was a nice visit - but there was work to be done! I sat back and listened; as Lloyd checked out what had been recorded while he was away, he gave feedback for all the things he loved. It was wonderful to hear how happy he was with what had been done. Everyone in the room was happy to agree on the final versions of each bedding track and get into the overdubbing process. This meant double checking each individual instrument on each track first, to ensure the sound was coming across the way it was meant to. The process was slow and repetitive as Lloyd paid close attention to every detail. He started by going through the drums on each track so that Brennen could go about the rest of his day. Overall, day two of this journey through the studio was a success - things were accomplished, fun was had, music was played, and recordings were made. Sixteen hours of studio time down - sixteen hours left to go. I can’t wait to show you how tomorrows session goes!